When you’re a parent trying to navigate the rough waters of children and sleep, advice seems to pour in from every direction. The world of sleep research is growing rapidly, yet many people are ill-informed regarding the science of sleep. Instead of feeling like you’ve been thrown a life preserver, most sleep advice just makes new parents feel like they’re drowning in confusion and contradiction. Here are the 5 most common sleep myths I encounter when I work with families as a Child Sleep Consultant and the facts you need to know to get healthy sleep for your family. Myth 1: If you keep your newborn up during the day he’ll sleep better at night. Newborn sleep is unorganized because babies are neurologically immature. Sleep is a function of the brain and sleep rhythms develop as babies grow and their brains mature. It’s normal for a newborn to have day/night confusion until night time sleep begins to organize around the 6-8 week mark. This is a great time to establish a regular bedtime and implement a calming bedtime routine. Keeping a newborn up for long stretches at a time will only cause the baby to become overtired. When babies are overtired their bodies produce excess cortisol. This imbalance makes it difficult for babies to fall asleep and stay asleep. Keeping your newborn as well rested as possible during the day is the best approach to encourage a restful night of sleep. Most newborns can only withstand being awake for 45 minutes to 1 hour before they need to go back to sleep. Myth 2: If you keep your child up later at night he will stop waking so early in the morning. One of the greatest predictors of an early rise is a late bedtime. If your little one is always up with the birds, instead of pushing bedtime back, first consider moving bedtime earlier. When children are chronically overtired they have a difficult time consolidating sleep cycles which leads to wakeful nights and early mornings. If your baby, toddler or younger school age child is getting less than 11-12 hours of night time sleep and rising early, try an earlier bedtime. Sleep is regulated by our internal clock or Circadian Rhythm. Most babies and toddlers feel a biological drive to sleep between 6-7pm. Experiment by moving bedtime earlier in 15 minute increments. Hold each change for 5 days and observe what happens with the morning wake time. It’s only in cases when a child’s sleep needs are being met that pushing bedtime later is appropriate. Myth 3: Never wake a sleeping baby. While it may seem unnatural to wake a child who is sleeping soundly, there are times when capping a nap or waking your child to start the day is necessary to encourage a better overall pattern of sleep. Wake a sleeping child if the last nap of the day is going late and you’re seeing interruptions with bedtime sleep, such as difficulty falling asleep or night waking. It’s also appropriate to cap a nap if you’re trying to prolong your child’s current sleep schedule before diving into a nap transition. For example, if your 14 month old is taking two naps a day starting at 9:30 and 1:30, and he begins consistently playing through the second nap, capping the first nap is a great strategy to hold on to the two nap schedule. If your child has a pattern of poor night time sleep and you’re working at creating a better sleep pattern for him, waking him up at the same time every morning and exposing him to light will encourage his body clock to reset. Myth 4: He’s probably just a child who doesn’t need a lot of sleep. While it’s true that some children function better than others on less sleep, there are some basic targets to shoot for when it comes to sleep needs. On average, babies 3-12 months need about 14-15 hours per day, 12 months-preschool need 12-14 hours per day and children ages 4-9 years need an average of 10-11.5 hours of sleep a day. If your child is rarely sick, manages his emotions well and doesn’t struggle with learning or social situations you can bet his sleep needs are being met. If he struggles in one or more of these areas you might want to experiment with helping your child get more sleep. If your little one isn’t even close to getting the recommend amount of sleep, it’s never too late to implement strategies to teach the behaviour of independent sleep. 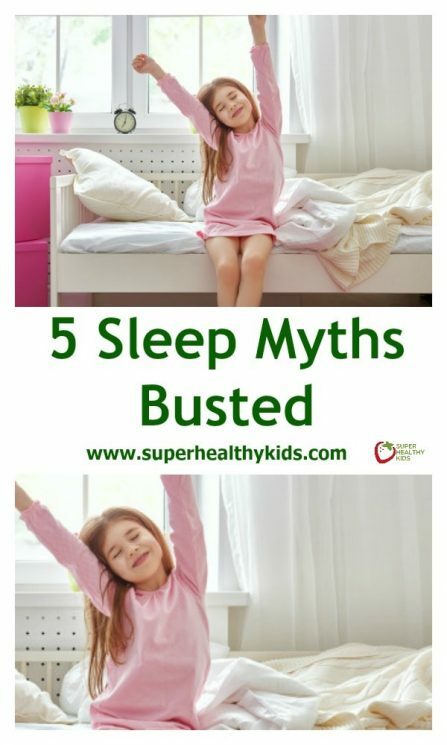 Myth 5: I’m a terrible sleeper so my kids will be terrible sleepers. Attitudes about sleep run in families. Just because you have poor sleep skills, doesn’t mean the same must be true for your children. Sleep is a skill that we all need to learn. Some people have the opportunity to learn it as babies while others struggle with this skill throughout their adult lives. Certainly there are temperaments and personalities to factor into the equation, and with any skill, some people will catch on more quickly than others. But the key here is that sleep is something we learn to do. We don’t hesitate to teach our children to eat, walk, hold a crayon or ride a bike so why do we ignore such a basic human need and chalk it up to bad genetics? If this is a sleep myth that runs in your family, bust it so that your children can get the healthy sleep they need to thrive.